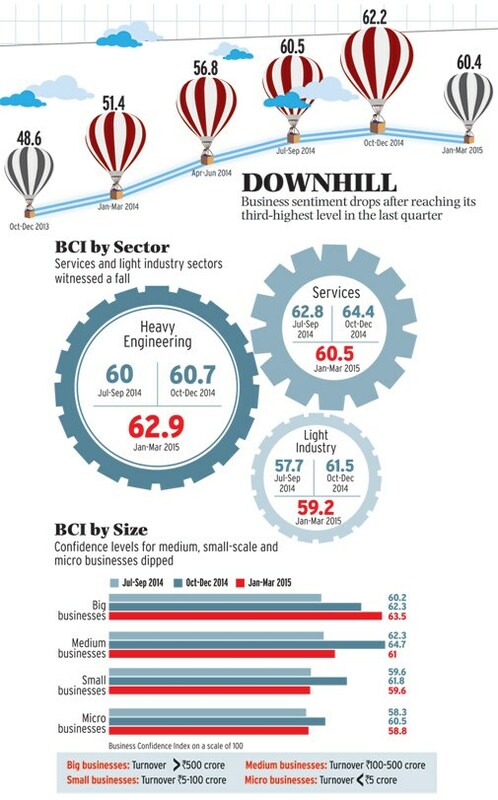 Business sentiment is taking a hit as corporate India waits for the government to ring in key reforms to kickstart growth, finds out the latest Business Today-C fore Business Confidence Survey. The National Democratic Alliance (NDA) government has often been dubbed by the opposition as 'pro-industry', a tag it has tried hard to shake off. But now Narendra Modi and his team are increasingly feeling the heat from businesses for not doing enough to mend the economy. A strong NDA government, with a clear majority in the lower house of Parliament, had promised to shake off policy paralysis and ring in far-reaching reforms. Less than a year into its term, the honeymoon period seems to be getting over. Indian businesses are still grappling with a bunch of problems, including weak rural demand, high borrowing costs and uncertainty around the crucial land acquisition bill. True, Modi has taken some steps to show that he means business. The coal and spectrum auctions, the Jan Dhan Yojana, hike in insurance and defence FDI limits, et al. But more was expected from the government. This is reflected in the latest Business Today-C fore Business Confidence Survey. Indeed, confidence levels, on a scale of 100, have slipped to 60.4 in the January to March period, down from 62.2 in the previous October to December quarter. This marks the reversal of the trend observed over the last few quarters. Business sentiments had begun to improve from October 2013 and had picked up pace after the NDA formed a stable government in May 2014. In fact, confidence levels rose for five consecutive quarters before a correction in the latest survey. Market research agency C fore quizzed 500 CEOs and chief financial officers across 12 cities for the study. "I know there is a lot of work going on... a lot of focus on ease of doing business"
Most indicators have recorded a sequential fall in the March quarter. Worse, the outlook for the June quarter too appears gloomy. Take overall economic situation, for instance. In the latest survey, 41 per cent of the respondents believed that the macroeconomic conditions will become worse in the April to June period. In the last two surveys, the comparative figures were 22 and 11 per cent. Several other crucial parameters have also registered a drop in confidence levels. These include production levels, cost of raw material, utilisation of production capacity, sales pickup, exports and hiring pickup. 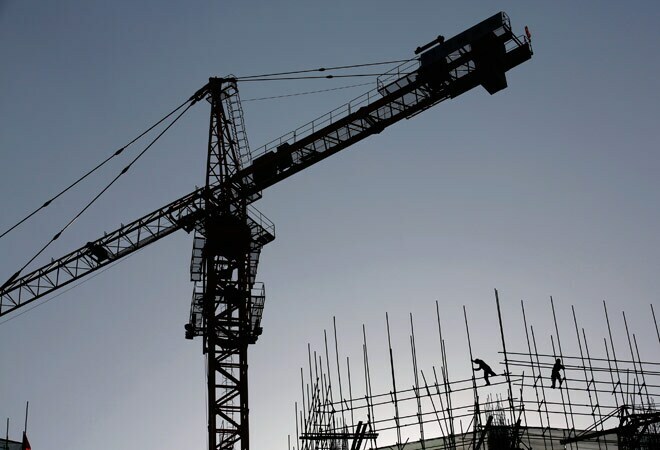 Forty per cent of the respondents expect production levels to fall in the June quarter -only 15 per cent expected a drop in the March quarter in the previous survey. Samiran Chakraborty, Head of Macro Research (South Asia) at Standard Chartered Bank, says that he is not surprised at the change in perceptions. "For several quarters, the sentiments were high. At some point, these sentiments were expected to correct since macro numbers have not improved substantially and the demand side of the economy is still struggling," he says. 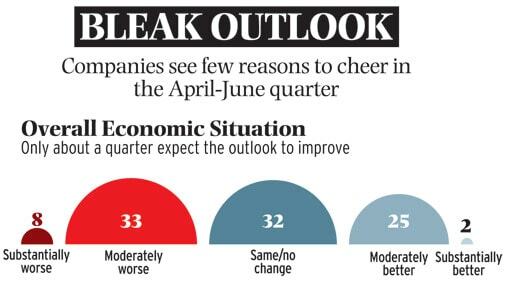 In the survey, 46 per cent respondents expect exports to fall in the June quarter. The comparative figure was 28 per cent in the last survey. India's merchandise exports in February dropped for the third consecutive month to $21.55 billion, down 15 per cent from $25.35 billion in the year ago period, according to the Ministry of Commerce and Industry. Clearly, sluggish global demand, with the European economy yet to stage a recovery, has taken its toll. It'll take another three to four quarters for the business environment to improve significantly, according to Ajay Shriram, Chairman and Senior Managing Director, DCM Shriram, a diversified group with interests in chemicals to textiles. "Investments have not picked up adequately but companies have started looking at expansion and growth. Ease of doing business is still a concern and rural markets are going through a low phase." "It's not that the government is not doing anything. It will take time for things to change materially"
Chris White, President and Group Chief Executive Officer at RJ Corp, says that the entrenched bureaucracy has failed to deliver adequate results though the government has shown intent. The company operates the largest bottling plant in India and its interests spans health care, hospitality, retail and education. "I think realistically they have done well. They are trying to tackle land acquisition and implement GST (goods and service tax). They need more dialogue between the industry and the government." The survey highlights that just 35 per cent respondents are willing to make fresh investments in 2015/16. It is a sharp drop from the last survey when 67 per cent respondents expected fresh investments to start pouring in this year. Domestic investments are not picking up because of lower capacity utilisation in manufacturing, high debt burden of corporate India and significant amount of non-performing assets in the banking system. A majority of the respondents - 61 per cent - are hopeful that inflation will remain under control, increasing chances of more interest rate cuts in future. D.K. Joshi, Chief Economist at CRISIL, says that the government's target of a CPI (consumer price index) at six per cent in January 2016 looks achievable. "There are two factors which will keep the inflation under control. These are low crude oil prices and weak rural spending. Monsoon will be the biggest thing to watch out for now," he says. The RBI has reduced repo rate by 50 basis points (bps) in two tranches since January. Banks have however not passed on these rate cuts to consumers and the industry. It is expected that banks will now be forced to cut lending rates in first quarter of 2015/16. Standard Chartered Bank's CPI target for 2015/16 is 5.4 per cent and it assumes that if inflation remains at that level, RBI will have scope to reduce key rates by 25 to 50 bps in the current financial year. "Investments have not picked up adequately but companies have started to look at growth"
Some believe that expecting quick results from the government is unrealistic. "It's not that the government is not doing anything, it will take time for things to change materially - infrastructure, labour will take time to fix," says Harsh Pati Singhania of JK Paper. Agrees Kiran Mazumdar-Shaw, Chairperson and MD of Biocon. "A few months ago there was quite a gap between the ground reality and positive rhetoric but now I know there is a lot of work going on at the back on self-attestation, a lot of focus on ease of doing business." But, all said and done, corporate India expects Modi to deliver soon. Sentiment may nosedive in the next few quarters unless there is a material difference to the situation on the ground. Market research agency C fore designed and conducted the survey, which was conducted between March 19 and 25, 2015. A structured questionnaire was administered to CEOs or CFOs of companies. 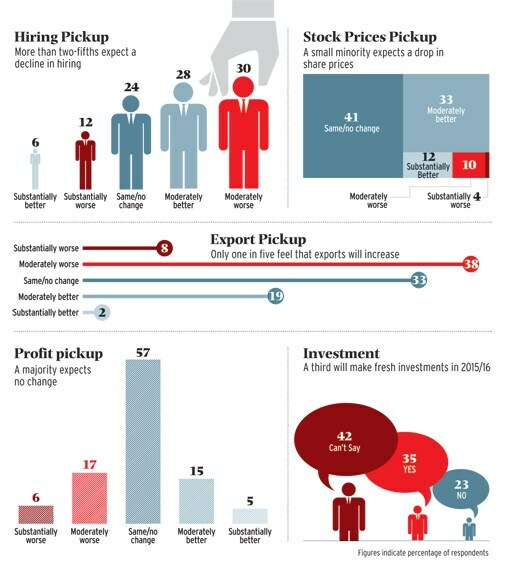 In all 500 CEOs or CFOs representing various industries in terms of sector and size were interviewed. The survey was conducted in 12 cities - namely Delhi, Mumbai, Chennai, Hyderabad, Bangalore, Kolkata, Chandigarh, Lucknow, Nagpur, Kochi, Vizag and Bhubaneswar. The companies were segmented based on their turnover and also the products offered by them. Those with turnover of over Rs 500 crore have been termed as big, those between Rs 100 crore and Rs 500 crore as medium, those with a turnover of less than Rs 100 crore as small and those less than Rs 5 crore as micro businesses.